Joined by purse designer Lana Marks who got a lot of pub based on Li Bingbing carrying that clutch. After the ceremony it was off to the Vanity Fair party where she seemed comfortable in the spotlight. Doing the Hollywood version of "grip and grin" with people other than Lana Marks. There was Milla Jovovich possibly talking about their time on the set of "Resident Evil: Retribution" that is in post-production. Their dresses look great together. Natalie Portman who is showing positive effects of recent pregnancy and childbirth. Getting cozy with diminutive and combative "Resident Evil: Retribution" co-star Michelle Rodriguez. And of course BFF Wendi Deng Murdoch. Gao Yuan-Yuan was in the front row at the Milan Versace Fall/Winter 2012 show along with blond English singer, a football player, a football columnist, the next Bond girl and someone's boyfriend. Before the show she looked devastating in white with a white leather jacket, all studded with gold rivets. She has a real presence and the still camera loves her as much as does the movie camera. "China Daily" ran a number of pictures of Gao Yuan-Yuan from Milan without identifying when they were taken. I think the mission of "China Daily" (or at least part of its mission) is to portray the official policy of the PRC to an audience that doesn't read Chinese. If that is the case, then the Party is going in the right direction in its celebrity coverage. The first two pictures from the shoot before the Dolce & Gabbana show. Before some show--more traditional but still nice. 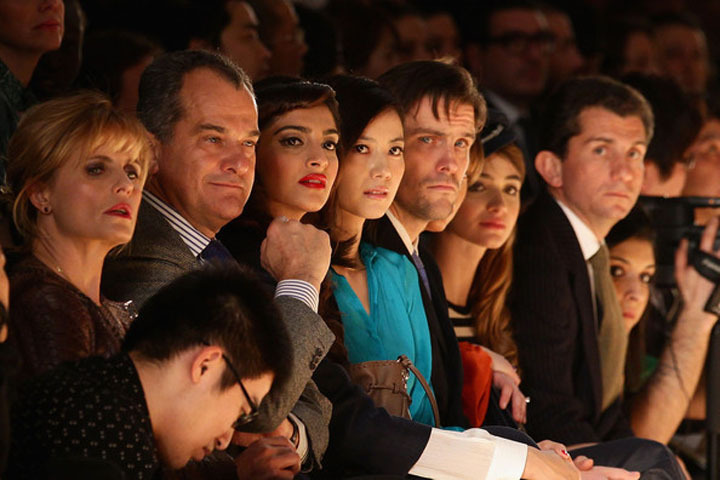 And a strange one from the Versace show--that's Wesley Sneijder of Inter Milan in the middle taking up a lot of space and crowding Gao Yuan-Yuan and Ilaria D'Amico, football commentator on Italian TV. Keep those knees and elbows in, Wesley. Inside waiting for the show to start and going along with the photographers' request for "just one more". I don't know if Gao Yuan-Yuan was the only Chinese actress as a guest at Milan fashion week but she was the only one covered in any detail by the PRC entertainment press. The Italians love selling luxury goods in China, not only clothing,. For example Bulgari gets most of its sales and profit growth from their boutiques throughout the mainland and China is the second largest overseas market for auto maker Ferrari. But women's garments are the most heavily promoted high-end products. In years past Zhang Ziyi has been the face of both Fendi and Emporio Armani. She was succeeded by Shu Qi for Armani. Shu Qi has also been a brand ambassador for Cavalli and Ferragamo. It may be that Gao Yuan-Yuan will be the next heavily promoted style icon for the Milanese. Li Bingbing went to Los Angeles for the 2012 Academy Awards and the Independent Spirit Awards (ISA). She hit a few photo events, walked some red carpets and gave an award to Guillaume Schiffman the cinematographer on "The Artist", the movie that won just about everything during the past couple of weeks. She picked up a $400,000 purse--since the expensive stuff like jewelry, couture gowns and crazy handbags are props they are returned at the end of the evening so she probably doesn't get to keep it even though according to a press release from the designer it has "Diamond Script Executed in Lana J. Marks Penmanship: "Li Bingbing". She killed at the Independent Spirit Awards in a Gucci gown, Kelly green on top, black and white skirt with appliqued tassel prints. With Giovanni Ribisi (who has enough indy/hipster cred for ten men but who is an excellent actor anyway) announcing the cinematography award at ISA. Doing her time in the press scrum, giving something quotable to the Associated Press. Not sure about Li Bingbing's outfit at the Women In Film Pre-Oscar Cocktail Party. Looks like a tailored bowling shirt with a spread collar over a garment that is beyond my ability to describe. I can tell it has pockets, though. On to the main event where Li Bingbing looked great in a textured Georges Chakra Couture strapless gown along with the super-expensive clutch. Sheer sinuous panels made it more interesting than the usual (and safe) ball gown look. On the red carpet with BFF producer Wendi Deng Murdoch. Deng Murdoch's earrings are worth a closer look. 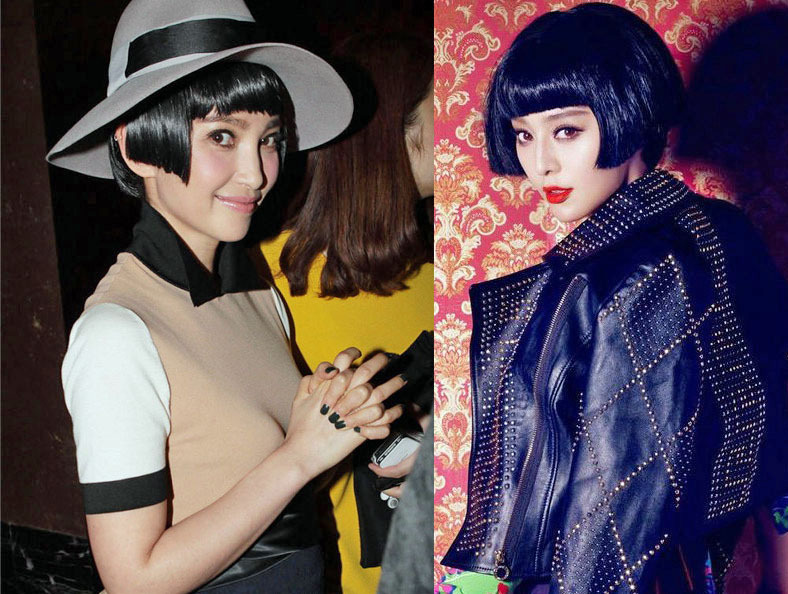 A photographer caught a few more or less candids of Li Bingbing in Shanghai, her hair in an angular cut bob, and ran a few of Fan Bingbing from a photoshoot that I can't recall with the same style. Each looks great although FBB may have a slight edge since the pictures of her are from a shoot with a stylist supported by hair and make-up assistance and are lit and posed by a photographer while LBB was impeccably turned out but not prepared for a fashion magazine spread. American actress Louise Brooks popularized the style; it became the look for daring young women during the "Roaring Twenties" in the United States--the flappers. Zhang Xinyi had a photoshoot for an unnamed (at least in the Xinhua article) luxury jewelry brand although she has such a stunning look that it the same images could serve for a cosmetics campaign. Another Xinhua article had her in a rolling around on the floor or checking her cleavage mode; the captions, at least as translated to English by Google/Babelfish, reads like a mash note. I don't know if Mainland actresses have publicists but if Zhang Xinyi has one he deserves a raise. Shu Qi in "Madame Figaro"
Posters and stills for "Love"